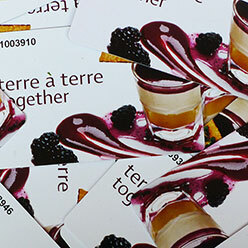 To say thank you and show appreciation for your loyalty as a Terre à Terre customer we have our Together Card. This card rewards all our customers by awarding points for every £1 they spend and allowing them to redeem them at their leisure with one simple swipe! If you already have received a card ( with a unique member number) make sure you activate it (activate card) and once you have both make sure you swipe every time you visit and start earning points. You can (sign in) to check you points anytime from the comfort of your home. 1 point allocated for every £1 spent with a 5% redemption, that’s £10 for every £200 spent. And a special place in the Terre à Terre family! 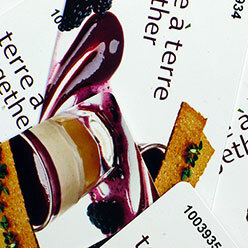 Terre à Terre Together Card is not a store card or a credit card. Cards belong to Terre à Terre Ltd.
To keep track of your points balance please talk to a member of the management team or check online via www.terreaterre.co.uk by entering your membership number on the card into the online points tracker. Terre à Terre Together Cards are individual to the member and cannot be transferred to or from one card to another (unless the card has been stolen) Please notify Terre à Terre of any stolen and lots cards. Terre à Terre is not responsible for any loss of points resulting in your failure to notify us. Terre à Terre can cancel or change the loyalty programme anytime without notice. No points are credited to the account if the bill is paid by redeemed points. 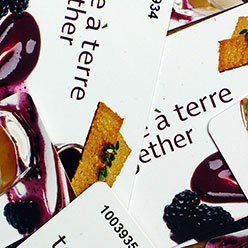 Points are only valid when the Terre à Terre Together Card has been activated by registration. But that’s not all, all our together card club members will be the first to hear news, receive offers and much more and should we need customer advice they will be the first to have a say!